Jet took-off (how punny) today with one of the first business models to possibly compete with Amazon. 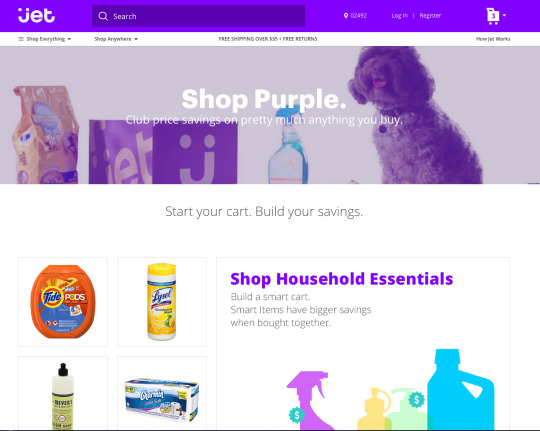 Jet is the brainchild of Marc Lore, a former Amazon employee and CEO of Quidsi, an Amazon competitor. Taking a page from COSTCO’s business model and pricing strategy, Jet makes money by charging a membership fee and passing all savings on to their customers. 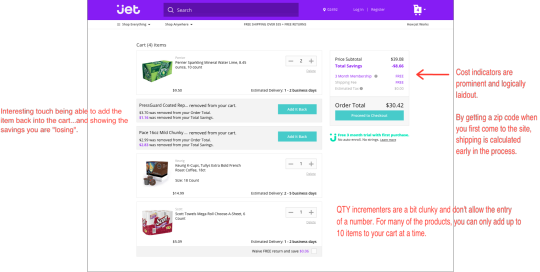 We were curious about the shopping experience on Jet so we went ahead and placed an order. Here’s what we found. The design is fine, certainly not great. Standard imagery combined with faded imagery (with weak contrast text), combined with product iconography contributes to a bit of a design mish-mash. Going through the Jet purchasing process is an interesting game of “how much can I save”; although, given the large amount of information being shown, the UX would benefit from a few tweaks. Lots of data makes it difficult to make a decision. Having multiple product sizes with different base prices and different discounts adds friction into the purchasing process. 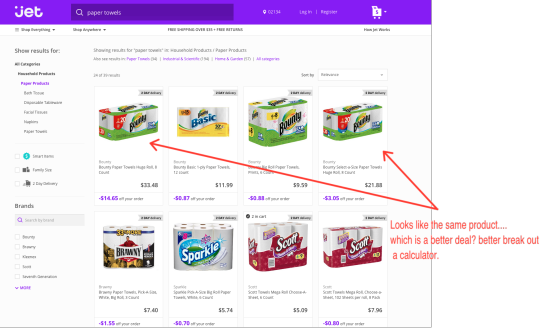 A tool to show “the lowest per unit cost for my preferred brands” would be great. By selecting a couple of preferred brands in a specific quantity, the consumer is able to reduce the decision down to price, since all else is equal. 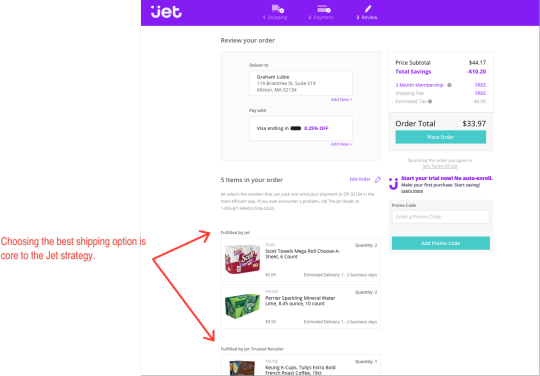 Jet’s checkout page has a great layout with some unique User Experience elements. 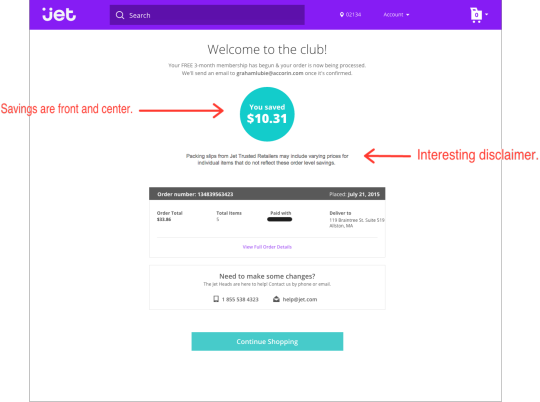 Showing shipping costs before an address is entered is a nice touch that many sites do not offer (or cannot since the shipping costs can only be calculated after the user has logged in or entered their shipping address). It’s clear that a lot of thought (and probably testing) went into the checkout process. Making a really simple checkout process is not easy. 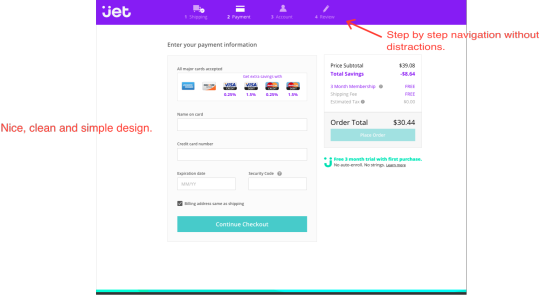 There is always the temptation to add additional steps, more payment options, upsells, etc. Amazon is guilty of adding a lot of elements to their checkout process. Jet has done it well. Even the order summary screen is nicely laid out. …and so is the final confirmation screen. Right down to the savings message. Would you buy again? Sure, but let’s see how the whole experience turns out. Would you recommend to a friend? Sure, but let’s see how the whole experience turns out. Jet launched fast with a streamlined, easy to use interface. We are looking forward to getting our first order and evaluating the complete buying experience. Feeling inspired by Jet? Looking to improve your customers’ e-commerce experience? Let’s talk.